Smart HEI-Business collaboration for skills and competitiveness aims to develop new smart and innovative cooperation methods between Higher Education Institutions (HEI) and Companies. One of the proposed models is Expert level real life problem solving (EXPERT). The model focuses on developing a well-defined framework that allows companies to access high level expertise that partners from European universities and companies have. In EXPERT projects companies introduce a real-life problem to be solved by a team of experts from HEIs (researchers, teachers) and companies. One project team includes a total of 6 experts from 3 different HEIs (3 different countries) and experts from the involved company. This enables companies to bring complicated problems to be solved by international and multidisciplinary experts. The cooperation model is tested by pilot projects, which are running in two phases (the first three started in January 2018 and the last three in January 2019). The company partners in the first project round are: Electrolux Lehel Ltd. in Hungary, ITAB Shop Concept Finland and S.C. ProTehnic SRL in Romania. The first pilot project is developed in collaboration with Electrolux Lehel Ltd. The topic is “Developing a pipe air flow resistance measuring device for vacuum cleaner pipes” and the company wanted expertise in following areas: mechanical engineering, electronics, aerodynamics (fluid dynamics) and data collection. For this pilot project, the HEI experts come from University of Miskolc (ME) in Hungary, Technical University of Cluj-Napoca (TUCLUJ) in Romania and JAMK University of Applied Sciences (JAMK) in Finland. The kick-off meeting of the project was arranged on 17th of January 2018 in at Electrolux in Jászberény and on 18th of January 2018 at ME in Miskolc. The second pilot project is developed in collaboration with ITAB Shop Concept Finland. Their topic is “Inventory management by Smart Fittings” and the company wanted expertise in following areas: machine vision, mechanical engineering, electronics, data collection, user interface and usability as well as logistics. For this pilot project, the HEI experts come from ME, University of Jaen (UJA) in Spain and JAMK. The kick-off meeting of the project was arranged on 23rd of January 2018 at ITAB in Jyväskylä and on 24th – 25th of January 2018 at JAMK in Jyväskylä. The third pilot project is developed in collaboration with ProTehnic SRL. The project topic is focused on “Development of new systems that implement IoT and lifecycle management in photovoltaic area”. For this project the company wanted expertise in following areas: electronics, sensors, data acquisition, microcontrollers, actuators, control systems and embedded systems. The HEI experts come from TUCLUJ, ME and JAMK. The project started with a kick-off meeting in 22th of January 2018 at ProTehnic and on 23th of January 2018 at TUCLUJ in Cluj-Napoca. The meetings in the beginning of the projects offered the opportunity to understand better the needs of the companies involved in the pilot projects. 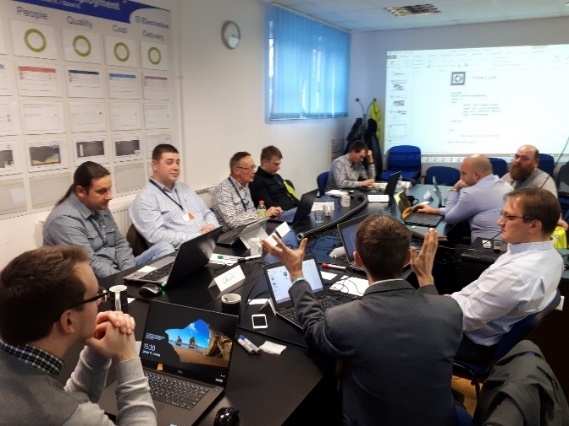 Opinion of the company representatives and the HEI experts was that these two meeting days were a success in starting the project activities and defining new steps for implementation. All participants showed real interest in the project theme and in solving the proposed theme.